A place for writing, inspiration, and other authorish things. Oh! This isn’t an odd question, but a feel-good one. Teven of Nowhere (the sequel to Bowman of Wellwood) is still something I’m working on, definitely. However, it sort of took a back burner when I put all of my energy into editing and re-editing Bowman’s story so I could get it ready for publishing. That also involved a few slight tweaks of the plot, which would translate into Teven’s story as well. I’ve definitely not forgotten Teven and my little wraith sprites, however, and that project is one of the next big ones on my list. Thanks so much for asking about it! XD Little guys causing trouble for the big guys is a great thing. Always leads to fun scenarios. This might only half count, but my wraith sprites tend to live in human dwellings because they are flightless. They have one advantage, though, and that is the ability to steal memories. Short term memories are easily snatched away, so even if they get spotted, they can quickly make someone forget. Some of the more daring ones could even walk out in front of a human, steal a cookie, and leave and the human won’t remember a thing. Poor humans, in these cases. For the answer about shadow sprites, I will direct you to this post, one of the first ones I made for the shadow sprites. Shadow sprites, beings created by the Night Spirit, are often maligned in folklore. This is something that they share with the wraith sprites, despite appearances being very different. Wraith sprites tend to be pale skinned, with any variety of hair and eye color (generally the colors are muted; nothing bright). They are flightless sprites, and make their homes in the hollow spaces of human dwellings more often than not. On their backs, instead of wings, they sport two sets of colored quills, that usually match the color of their hair. The quills can be relaxed or they can fan open. When open, wraith quillwings are like psychic radio receptors, enabling the sprite to listen in on the surface thoughts of beings around them. This plays into the way their colonies usually interact with one another – secrets are few and conversations can pass silently. I don’t have a lot of wraith sprite characters made yet, but one of the noteworthy ones is Teven Silver, who will be an important character in one of my upcoming stories. The wings of the major sprite varieties are varied, sort of as a reflection of the varying personalities of the Spirits that created them. Fire Sprites have protrusions on their backs that resemble bundles of twigs. They are vaguely the shape of butterfly or dragonfly wings. When vibrated at the right angle and speed, a spark is created, which ignites the wings and provides them with the thrust needed to take flight. Air Sprites have six wings each. Each pair is a different size, with the smallest on top, the largest in the middle, and the medium-size at the bottom of the arrangement. They are translucent, and made up of prismatic scales that can reflect light in many colors. They most resemble hummingbird wings in shape. Wraith Sprites have quills on their backs in place of wings. They can be flared out to look like wings, but they don’t offer flight. They can be found in a variety of colors, though are usually more muted than vibrant. When sprites mix across species, the child takes on more traits of their biological mother because of birthing constraints and the hormones available. Without new mixed genetics, it takes about four or five generations for mixed traits to disappear, however the connection to the Spirit takes almost three times that long to completely fade. 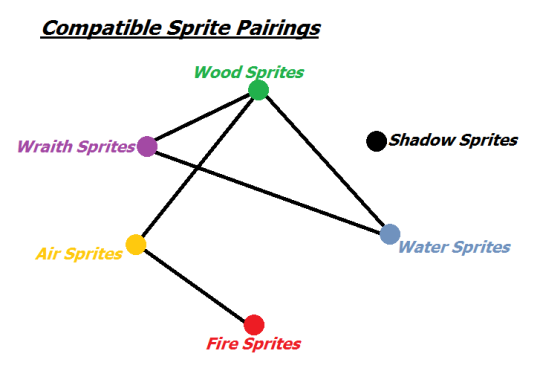 When mixed, the Spirits share a connection to the sprite. The resulting sprite may Pray to either, but can never have the full connection required for the Voice of the Spirit. Because of that shared connection, the Spirits involved must get along well enough and trust one another to be so close to a potential flow of their magic. Some sprite pairings cannot produce offspring because of this. Other minor Spirits exist, but they don’t often create sprites and when they do, they are not widespread. They cannot create offspring with the major sprites, either, because the Spirits that made them can’t share a soulspace with a Major Spirit. Only one Spirit has ever transitioned from Minor to Major: The Sight Spirit. Total Word Count: 50,000 words!!!!!! “‘You’re right about that. The stupid giant may seem like a brute but he’s actually very careful,’ I agreed. Alright! So this is another year of NaNoWriMo completed, and another challenge met! I was super excited when the characters started taking the wheel tonight, because this means for Thanksgiving I don’t need to mope about not getting any word count done. XD It was a real bummer last year. I will not be updating the tumblr anymore with progress on Teven, though rest assured I will continue to write it! I can’t stop now! It’s probably going to be about twice the NaNo goal when it’s all done, realistically. ^^; But! I’m glad to have done it, and thanks to anyone who followed this silly adventure of mine and supported me along the way! You’re the best! Also, have a happy Thanksgiving, if you celebrate it! Pretty good day today. I managed to drabble a little bit in my journal during the day for the first time in forever. The speaker, by the way, is a little wraithlet named Lore. His daddy is Teven Silver, the titular character of the story. Pretty good day for writing! I got a lot done and I am ready to hop back into more intrigue. Still feeling kinda meh health wise but I think I’m improving! So that’s good news. The writing must continue! This story is coming along so nicely and I am only in chapter 10. ;w; It’s gonna be a long book before I’m done. Favorite Excerpt: “Teven had rotten luck and he was not going to let the human have a pass for causing all of it. Ugh. Today was kind of a drag for writing in all projects of mine. I felt so slow. XD At least the weekend is upon us. I can make up for this lapse tomorrow. And then some. In other news, Teven Silver continues to be a darling little sass baby and I’m so excited to write more.